Bhajis are a much-loved Indian snack. 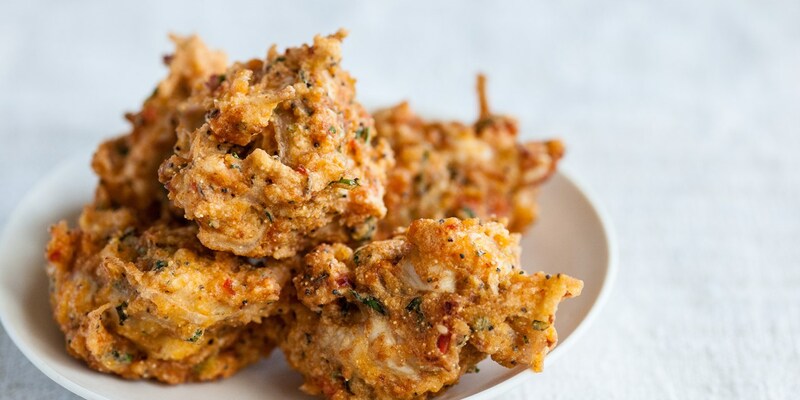 Most people are familiar with the humble onion bhaji, but all manner of flavours and fillings can be added to these tasty deep fried fritters. You can serve crisp homemade bhajis with a simple dipping sauce as a snack or starter, or as part of the main meal with a curry. This collection includes recipes for classic onion bhajis, like Alfred Prasad's recipe which uses an extensive mix of fresh and dried herbs and spices, as well as the traditional gram flour in the batter. Luke Tipping also uses mini onion bhajis as a flavourful alternative to croutons for topping his curried parsnip and pear soup. For more unusual variations, Marcello Tully favours meaty versions with an Italian twist, such as adding shredded cooked turkey to his turkey bhajis and spicy ‘nduja sausage to his salumi ‘nduja bhajis. Learn how to whip up traditional onion bhajis with our step-by-step How to guide.